Dietary fiber are edible but non-digestible plant carbohydrates composed of at least 3 monosaccharides; lignin, which is not a carbohydrate, is also a dietary fiber . Undigested fiber, which cannot be absorbed in the small intestine, reaches the large intestine where it may or may not be broken down (fermented) by normal intestinal bacteria into substances that can be absorbed. About 20% of the ingested fiber is excreted with the stool. Viscous fiber may increase satiety, lower blood cholesterol, reduce blood glucose spikes after meals and act as a prebiotic (promote the growth of beneficial intestinal bacteria) . May prevent constipation; possibly lowers the risk of diabetes mellitus 2  and heart disease [19,43]. How much fiber per day should I eat? Due to insufficient scientific evidence, the Institute of Medicine (IOM) in the U.S. has not established the Recommended Dietary Intake (RDA), but has rather estimated the Adequate Intake (AI) for dietary fiber, which is 21-38 grams per day for adults (Chart 2). Adequate Intake is amount of fiber, which was in several studies associated with lower risk of chronic diseases. If you, due to your family history, believe you may be at increased risk of diabetes mellitus 2 or coronary heart disease, you may consider having a diet high in fiber. On the other hand, if you believe fiber irritates your gut you may discuss with your doctor about decreasing certain types of fiber. Peeling and removing seeds from fruits or vegetables and removing bran from cereal grains usually decreases amount of fiber (mainly insoluble). Cooking, canning and freezing usually does not significantly affect food fiber content . Cooked and cooled potatoes, pasta, noodles or rice contain more resistant starches (a type of soluble fiber) than hot foods . During low-residue diet you should avoid eating whole grains, nuts, fruits and vegetables with peels. “Dietary fiber” is fiber that naturally occurs in foods and is intrinsic and intact in foods . 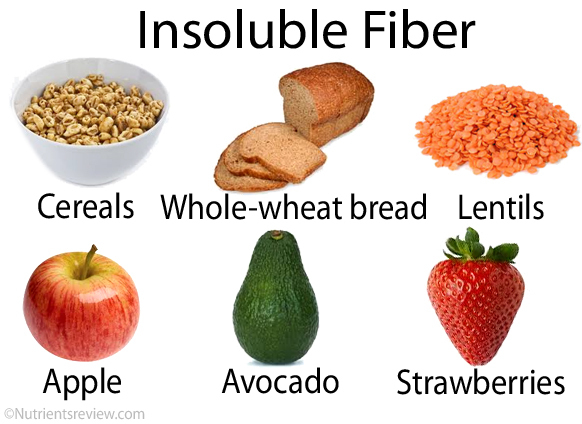 “Added fiber” is fiber isolated or semi-synthetically produced from plants or crustaceans and added to foods . The purpose of added fibers is to improve the texture and taste of foods rather than to prevent or treat diseases, since the amount of added fiber is generally small . There is also a lack of studies about health benefits of added fiber. Types of fiber commonly added to foods include alginate, beta-glucan, cellulose, chitin, chitosan, fructo-oligosaccharides (FOS) or oligofructose, gums, hemicellulose, inulin, modified starches, pectin, polydextrose, resistant dextrins or maltodextrins and soluble corn fiber. Common foods with added fiber include breakfast cereals, pre-prepared soups, yogurts, snacks, energy bars, powdered drinks, fruit juices and canned foods. Added fiber along with fiber in supplements is often called “functional fiber.” According to Institute of Medicine in the U.S., functional fiber is fiber that may have health benefits for humans and includes chitin, chitosan, fructo-oligosaccharides (FOS), inulin, polydextrose, psyllium and resistant dextrins and starches . “Total fiber” is dietary fiber plus added fiber. To date, there is no conclusive evidence that dietary fiber actually helps to prevent or treat any disease . In many studies, consuming high-fiber foods was associated with lower risk of certain diseases, but it is not clear, if the beneficial effect was due to fiber or other food ingredients, such as potassium and magnesium, lower intake of saturated fats or more physical activity and healthier life style commonly observed in individuals who consume a lot of fiber-rich foods [11,43]. Low fiber intake is a cause of constipation only in some people and is usually not the only cause . In several trials in adults with chronic constipation, dietary fiber intake was associated with the increased frequency of stools [3,6,31]. 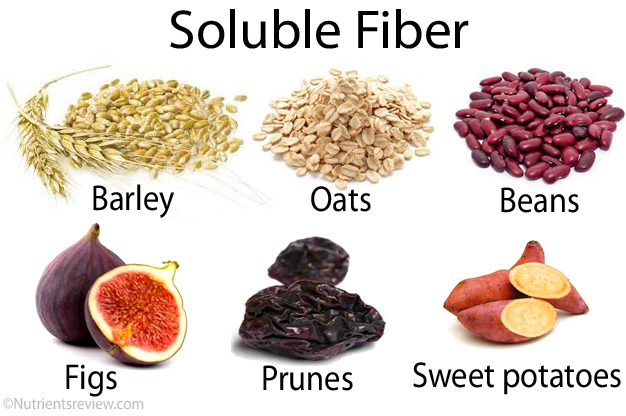 Foods high in soluble fibers, such as dried plums (prunes)  rather foods high in insoluble fiber may be beneficial for chronic idiopathic constipation, but more research is warranted . Fiber supplements, such as cellulose and psyllium, were only modestly effective [3,19,33]. In constipated children, fiber-rich diet and fiber supplements may not be always helpful and may increase abdominal pain [35,37,38]. Crohn’s disease and ulcerative colitis. It is not yet clear if dietary fiber helps to prevent Crohn’s disease or ulcerative colitis [3,19]. Diverticulosis. There is insufficient evidence about the beneficial effect of dietary fiber on diverticular disease [3,19]. Gastrointestinal reflux disease (GERD). Dietary fiber (probably insoluble) may help relieve GERD symptoms . Hemorrhoids. According to one systematic review of studies, fiber supplements may decrease symptoms related to hemorrhoids, especially bleeding, for about 50% . Irritable bowel syndrome (IBS). According to 3 systematic reviews of studies in individuals with IBS, high fiber intake of soluble, but not insoluble, fiber may help relieve constipation, but not abdominal pain, in some, but not all, individuals; in some cases, insoluble fiber, such as wheat or corn bran, may even worsen constipation [3,34,39,44]. In several studies, psyllium husk supplements helped to prevent constipation but not diarrhea and pain [3,7]. Partially hydrolyzed guar gum may help in both constipation- and diarrhea-predominant IBS [3,8]. In interventional studies, lasting for several weeks, oat bran, barley and bean products, and viscous fiber supplements (guar, pectin, psyllium) were associated with decreased total and LDL cholesterol blood levels [3,19,41]. The cholesterol-lowering effect of viscous soluble fiber becomes obvious after few weeks of taking and lasts only if fiber is taken on a regular basis [12,13,14,15,16]. In one 2013 systematic review of observational studies, researchers have found an association between dietary fiber intake and lower risk of cardiovascular disease, and further an association between the intake of insoluble fiber, fiber from cereals and vegetables and lower risk of coronary heart disease . Intake of every 7 grams of fiber was associated with 9% lower risk of cardiovascular disease. Other studies have shown similar results [3,10,11,19]. There is SOME EVIDENCE that high fiber intake is associated with a lower risk of stroke [49,50]. In individuals with diabetes 2, viscous soluble fiber (guar gum) added to carbohydrate meals may reduce fasting blood glucose levels and blood glucose spikes after the meals [3,10]. Surprisingly, in several studies, high intake of insoluble fiber from whole grains, but not from fruits and vegetables, was associated with lower risk of diabetes type 2 [1,3,53]. Some researchers recommend consuming 25-50 grams of dietary fiber (both soluble and insoluble) per day to individuals with diabetes 2 . There is insufficient evidence about the effect of high fiber intake on weigh loss [3,19]. While conclusions of few systematic reviews of clinical trials suggest that diet high in fiber can have a mild blood pressure-lowering effect, there seems to be insufficient evidence about a high-fiber diet as a mean of treating high blood pressure [51,52]. There is insufficient evidence about protective effect of dietary fiber on colonic cancer [3,19,21] or breast cancer . In one study in individuals with colorectal adenomas, psyllium supplements in a dose 3.5 g/day were even associated with increased recurrence of adenoma . Eventual effect of dietary fiber on immunity is not yet clear . Practically all types of dietary fiber are available as over-the-counter (OTC) supplements. Psyllium husk powder, for example, contains 50% soluble and 20% insoluble fiber [47,48]. Most doctors recommend eating fiber-rich foods, which are also typically rich in minerals and vitamins, rather than taking fiber supplements. Fiber supplements should be introduced slowly to prevent abdominal bloating or diarrhea, and always with a sufficient amount of water to prevent choking or bowel obstruction . Abdominal bloating and excessive gas (flatulence) may be caused by soluble fiber : psyllium husk, beta-glucan (oats, barley), guar gum and other gums, inulin and fructo-oligosaccharides (artichokes, onions), polydextrose, resistant starch [3,19]. Gastroesophageal reflux disease (GERD) may be worsened by consuming foods high in fructo-oligosaccharides  (wheat, onions, leeks). Loose stools or diarrhea may be caused by cellulose supplements. A clump of undigested food–a bezoar–in the stomach or intestine may, rarely, develop in people who eat large amounts of oranges, persimmons, berries, figs, apples, coconuts, green beans, sauerkraut, Brussel’s sprouts, potatoes with peels or sunflower seeds with shells . Allergic reactions, including anaphylactic reactions, after taking chitin or chitosan (in people allergic to shellfish), psyllium husk, inulin or other fiber are possible . Foods high in fiber are unlikely to decrease mineral absorption, but cellulose supplements may impair calcium absorption . It is not fiber, but phytate in plant foods, such as cereals and legumes, that may decrease the absorption of minerals, such as iron and calcium . Pectin or guar gum may decrease absorption of beta-carotene, lutein and lycopene . Certain fiber supplements may affect absorption of certain drugs (read information leaflets), so drugs should be taken at least one hour apart from fiber supplements . 1. Why is fiber important? Fiber can help to maintain regular bowel movements. 2. Is fiber an essential nutrient? Is fiber deficiency possible? Fiber is not considered essential nutrients because no specific symptoms of fiber deficiency were recognized so far . 3. How can I increase fiber content of meals without significantly changing my diet? You can eat some delicious whole-grain bread instead of white one, and you can add beans or lentils to salads. 4. What are some high-fiber, low-calorie, low-fat foods? Some non-starchy vegetables, such as winter squash, turnips and eggplant, and beans, peas and lentils. 5. Which foods are rich in protein and fiber? Beans, peas, lentils and nuts are high in protein and fiber.